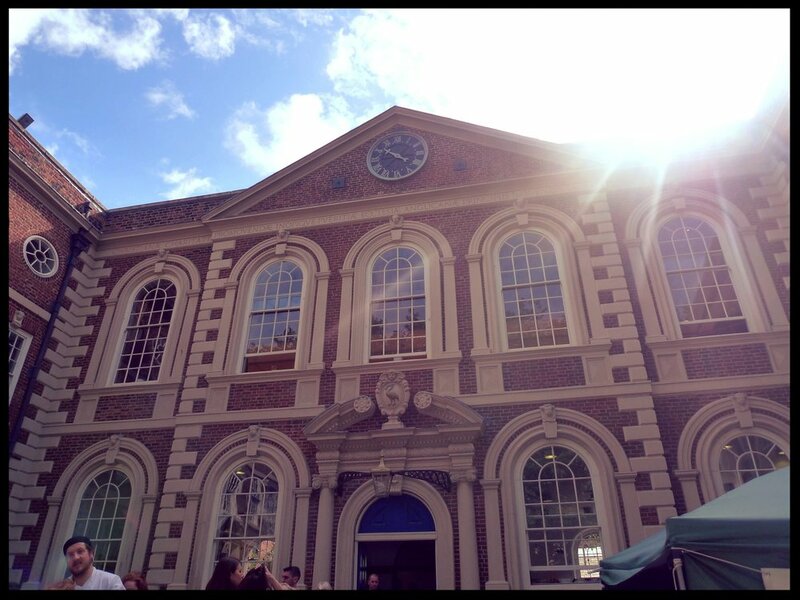 Bluecoat Chambers- The oldest building in central Liverpool, completed in 1717, and is now an art center. It houses Probe Records and while we were visiting there was an arts market with many different local artists and designers selling their work. It was bustling and also had some food trucks/stands. Liverpool Central Library- When you look up at this library it feels like you are inside of a space center or spaceship. It was really cool! Like many of the libraries we visited in England, it has an impressive collection of books and it has a cafe where you can relax for a bit too. Liverpool Anglican Cathedral- A different type of cathedral that felt very open and even displayed a neon light, and had a restaurant. It is the largest cathedral in all of Britain and the largest religious building. The facade is very unique in it’s reliefs and sculptures. I found “The Welcoming Christ,” by Elisabeth Frink to be especially different from other christ images. Once we were finished exploring the church we visited the St James Cemetery. A cemetery opened in 1829 with many interesting tombs, and a great little peaceful walk to do. You enter the cemetery via a small tunnel, which gives it just the right amount of spookiness. International Slavery Museum- This museum is as depressing as one would expect, but a necessary place to visit. The museum acknowledges how big Liverpool’s role was in the business of slavery, and I imagine if there was more acknowledgement around the world, especially in America, about the horrors of slavery and the strength of enslaved people maybe humans could start healing and get closer to justice and balance as a society. Skipping the eating section because we spent most of our time in pubs. Liverpool is filled with wonderful pubs. Jacaranda- A pub originally owned by Allan William, it was the first home of The Beatles and has been an important part of the music scene since 1958. It’s also home to a 1948 Voice-ograph recording machine that records a track directly to vinyl. It wasn’t working when we were there, which was sad, but we got to see it. The pub had a downstairs and upstairs part. The upstairs is where the record store is located and is a bit more relaxed, but both areas are great. The Ship & Mitre- We were told about this pub by a local, and we loved it. It was near where we were staying so we went a few times, and it is the type of bar you feel comfortable in. It was built in 1935 as a coach house. It still has some of it’s Art Deco features, and it has a large selection of beer. Philharmonic Dining Rooms- Known as ‘The Phil’ to locals it was John Lennon’s favorite pub, and it is absolutely stunning. Every area is decorated with beautiful design, and the men’s bathroom is so ornate and special that it is even more important than the building itself. The pub was built in 1898-1900 for the brewer Robert Cain. It was designed by Walter W. Thomas. The interior is decorated in musical themes that relate to the nearby concert hall. The smaller rooms are titled Brahms and Liszt, and it just an amazing pub. The Lisbon- A popular gay bar with a beautiful ceiling and friendly staff. The entire place is very ornate. The Grapes- This is the bar The Beatles used to drink at because Cavern Club didn’t sell booze. Sometimes it pays off to do day-drinking, because we were the only two people in the place. We got to sit in the exact booth where The Beatles used to sit, and they have a photo on the wall above it to prove it. It was a cool moment to get to enjoy the experience of just being there, and not have people swarming with cameras. White Star- A traditional Victorian pub where The Beatles used to get paid after their gig at The Cavern Club. We visited The Cavern Club too (for it’s history even though it’s not the original), but for us it was more like a Disney attraction and less like a music venue. It was to be expected. We didn’t mind, but we didn’t stay either. We preferred to have our pint at the White Star or The Grapes. It’s obvious what you should listen to, but these are the songs stuck in my head while walking the streets of Liverpool.